You are currently on the US site. Switch to another country? Yay! I love seeing the StudioWedBox waiting for me in the mail box. This is my fifth StudioWedBox. 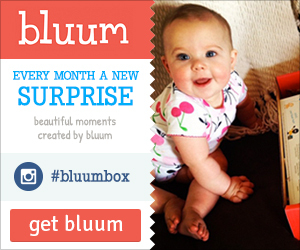 This month’s theme was ‘old, new, borrowed & blue’. This month’s tip was to make sure you book your wedding officiant early, at least 6 months in advance if possible. Well I would never have thought of a handkerchief. Probably nicer than carrying around a packet of tissues. 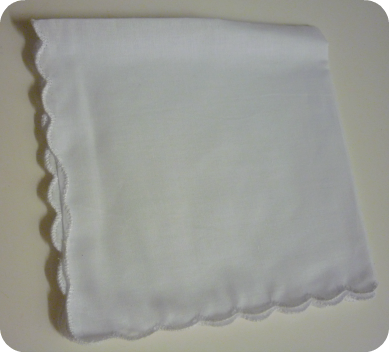 Although I always feel a bit weird about handkerchiefs, I’d rather just use a tissue and throw it away. 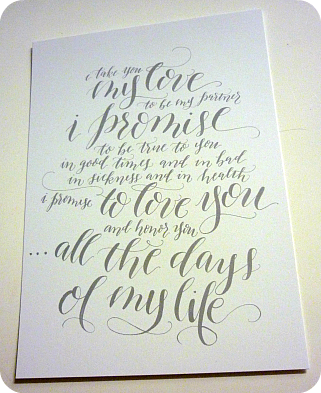 After browsing wedding embroidery on etsy I’m feeling a little crafty so I will give embroidering this a go! I actually didn’t know what a boutonniere pin was when I opened this box! Apparently it’s french for buttonhole and it’s a pin to help keep the flower on the groom’s jacket (as well as the groom’s men, father of the bride and father of the groom). So there you go. I’ll have to pay more attention to the groom outfit section of the wedding magazines! This is made out of clay and feels quite nice. Maybe a little heavy? 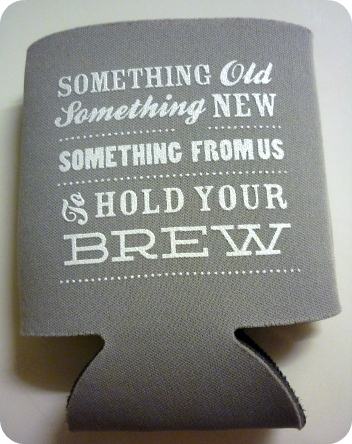 Stubby cooler (Koozie) by Rook Design Co.
I’m a big fan of the stubby cooler and I do have a bit of a collection going. It’s high up on my wedding favour list to do a stubby cooler, so I am glad to see a sample. Value wise it costs $134US for 100 Koozies, which works out to $1.34 per item. That is pretty good value. 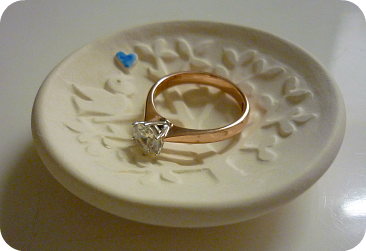 This is a cute little ring dish. 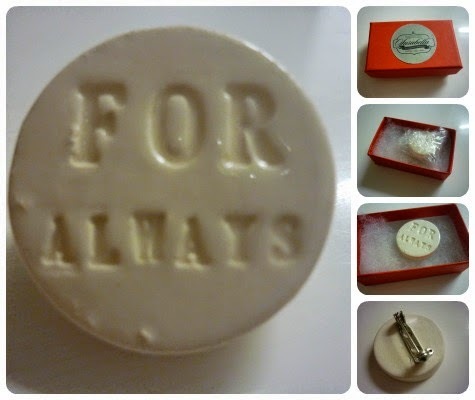 I already have a ring holder, it’s a cute elephant that I got in a PopSugar Must Haves Box. I couldn’t find a value or the supplier for this dish online. What a great idea! I wouldn’t have even thought of freeze dried petals. The website says these are non-staining, not slippery, all natural, eco-friendly and biodegradabl. So that’s bound to make the wedding venue happy. The rose petals come in lots of different shades and while they are based in the US, they do ship internationally. Oh wow, a quick google and there is plenty of Australian suppliers for freeze dried rose petals. Who knew. These two supplier look good – Simple Rose Petals and Rose Petals by The Flower Factory. 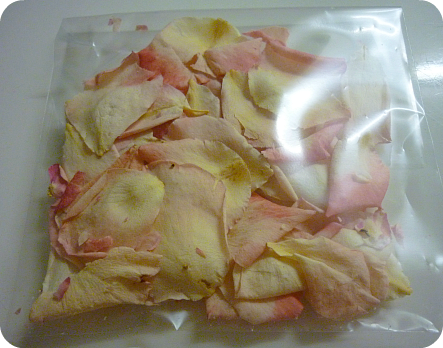 I’d love to hear from anyone who has used freeze dried rose petals. How many is a good amount to get and how did you distribute them? Also in the box was a coupon for The Garter Girl (this pink and ivory lace one is my favourite) and a cute 5 inch x 7 inch postcard from Five Dot Design. International subscribers (e.g. me!) pay $39.99 per month plus $10 postage. Bringing it to $49.99US in total, which on today’s Aussie Dollar is $64.78. I love this subscription. It helps me to plan and think outside of the box. Every month it provides me with ideas and inspiration. Value wise this month I received approximately $45US worth of items plus the postcard and a garter 50% off coupon. So it is pretty much spot on what I spent. PS – This month I’d love to hear what was (or will be) your something old, something borrowed, something new and something blue. Hi there! 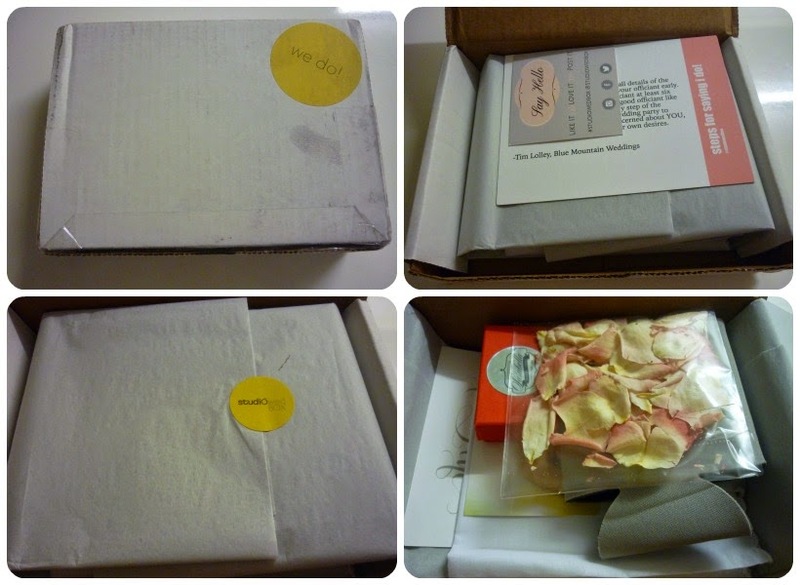 I’m Prue, and I want to help you discover the great things that can come in your mail box. Joy in the Post is a blog celebrating all the fantastic subscriptions you can receive in the post. I love tea, ballet flats, cupcakes, cute fashion, healthy living and dance classes.